It’s been a while since I wrote about running and fitness in general, so today’s the day for an update! And yes, you’ve read it right – my running as of recently has involved a treadmill. The good ol’ ‘dreadmill’, as it’s known among the running folk for its ability to induce epic boredom. Why have I decided to start using it? 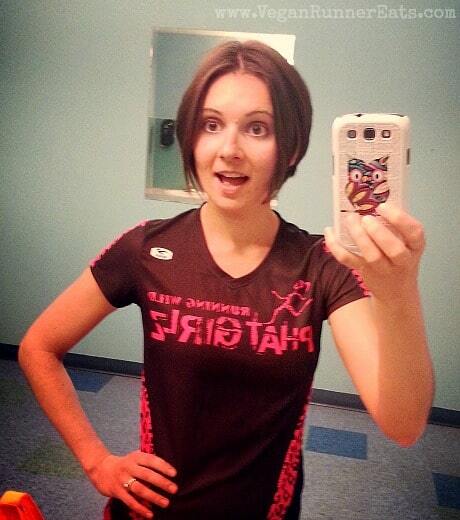 Read on – and you’ll find out how I manage to keep my treadmill runs fun and challenging. In fact, it all started with me stopping running for some time. In the past five weeks or so, I made a conscious decision to avoid running so that to give my injured foot some long-deserved rest. You may remember me mentioning plantar fasciitis that’s been bothering me since a couple weeks before I ran my marathon last November – that’s a long time ago! Unfortunately, like a lot of runners I fell into the trap of never taking time off from running in the months that followed as I was too attached to the feeling of joy and relaxation that each run brought. Slowly, my foot started to take longer to recover after each run. At times, it was even painful to walk… I began to get concerned that my foot will never get better since I was still running pretty often. Eventually, in the beginning of June I decided to eliminate running from the list of my regular exercise activities, at least for a while. Around the same time, I also signed up for a gym membership – I’ve been gym-free for a couple months since we moved to WA, and while I enjoyed my bodyweight workouts on our front porch in the morning a few times a week, I was also mixing in running into my routine, and my plantar fasciitis-ridden foot was not happy at all. With the gym subscription came fun HIIT (high-intensity interval training) workouts with free weights, and I fell in love with my new exercise routine! These days, I stop by the gym on my way home from work 4-5 times a week (I work 7 am to 4 pm), and make sure to exercise with weights on Monday, Wednesday and Friday. Tuesday and Thursday are the cardio days – elliptical machines are a big help. This new routine has been a lot of fun, and I don’t find it overly time-consuming because on most days, my workouts last only 25-35 minutes with warm-up and stretching at the end, and I’m still back at the house in time to make a quick dinner (unless Rob makes it about once a week), spend an hour or two on my blog, and go to bed around 10-10:30. So this back and forth with my mind has been going on for a while. And then a couple weeks ago, I arrived at a compromise with myself: I decided to do just a little bit of running on treadmill, since treadmill belts are softer than pavement and allow less impact. A lot of runners despise treadmills because they can lead to epic boredom, but this time, treadmill running seemed like the only way to offer the solution to two of my issues – one, providing a softer running surface, and two, allowing me to stop my running session sooner without getting carried away and running too long. Thankfully, I’m one of those lucky people who don’t get bored easily. Running on a treadmill has never been a problem for me – except that one time when I fell off of one and skinned both of my knees against its belt still running at 8.8 miles per hour – but I still have to deploy some tricks to make sure it stays fun. Today I’m sharing with you a few treadmill workouts that help me get in a great run on a treadmill while staying focused. The most frequently cited piece of advice about treadmill running is ‘listen to some music/read a magazine/watch TV’, so I’m going to skip that and go straight to the actual running. While there are plenty ways to get distracted on the run, sometimes we may benefit more from staying focused. By doing the workouts I’ve listed below, we teach our bodies how to run more efficiently while watching the time fly by! For each workout, choose a ‘comfortably fast’ speed that allows you to maintain a conversation with a partner (if you have one). The ‘fastest’ speed should allow you to run quite fast but not all-out , in the range that you can maintain for each of the fast repeats of the workout. 1. Mix in some speed intervals during your run. Start with a walking/jogging warm-up of ¼ to ½ mile, then raise the speed to comfortably fast for ¼ mile. Next, raise the speed to 1-1 ½ miles faster than your comfortable level for a ¼ mile, then lower the speed back to your comfortably fast level. Alternate the ‘comfortably fast’ intervals with ‘even faster’ ones 4-6 times (or more if you’re an advanced runner), finish with a 1-2 minute jog. I’ve been doing this workout with speed varying from 6.2 to 7.4 mi/hr. The benefit: you’ll burn more calories when adding some intensity, plus the time goes by much faster when you switch the speed every ¼ miles. 2. Pyramid intervals. These work in a similar way as the regular intervals above, but the speed is raised more gradually. Start with a ¼ to ½ mile warm-up, then increase the speed to comfortably fast. Next, raise the speed by 0.5 mi/hr for a ¼ mile, then add another 0.5 mi/hr to your speed for the fastest ¼ mi interval. After this one, lower the speed back by 0.5 mi per interval until you’re back to your ‘comfortably fast’ level. This sequence will take you about one mile to complete a full ‘pyramid’ if you follow the ¼ mile interval pattern. My speed during a most recent pyramid workout: 6.2 mi/hr ‘comfortably fast’, 6.7 mi/hr ‘faster’, 7.2 ‘fastest’, repeated over the course of 3.2 miles. The benefit: in addition to burning more calories than if you ran the same distance at a steady pace, you teach your body to handle faster speed more efficiently. 3. Timed intervals. You can do these in the same pattern as the regular or pyramid intervals above, but in this case, use your timer, not distance, to measure the intervals. You can go at one minute fast – one minute slow, or 2 minutes fast – 3 minutes slow, the choice of speed and interval duration is yours. The benefit: As you watch the treadmill timer to get you to the next interval, you’ll be surprised to see how fast your workout goes by! 4. Incline intervals. You guessed it – this workout is about raising the incline of your treadmill during the harder intervals, and lowering it for recovery. Start with a basic incline of 1, and move it up to 3-5 (or higher if you’re an advanced hill runner) for each of the harder intervals. Do this workout with timed intervals, i.e. 1 minute hard – 2 minutes easy, or ¼ mile hard-1/4 mile easy, etc., and don’t forget your warm-up and cool-down! Caution: if you haven’t done any hill running recently, your calves may get quite sore the following day! 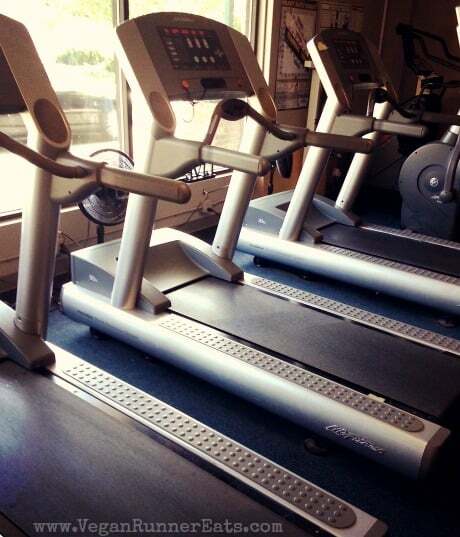 The benefit: by increasing the incline of your treadmill, you teach your body to run hills more efficiently. 5. Mix in some strength training! I love this routine when I’m short on time, and want to have a full-body workout with high intensity. Run ¼ to ½ miles on the treadmill at your ‘comfortably fast’ speed, then get off and do 3-4 bodyweight exercises. My favorite combo is 20 push-ups, 30 sit-ups, 40 air squats, but you can put together a routine of your own from any exercises, as long as they target your whole body. Once you’re done, get back on the treadmill and run another ¼ to ½ miles, then repeat the exercises. Repeat the sequence 3-5 times depending on how much time you have – I usually get in 4 running repeats with 4 rounds of bodyweight exercises, and by the end I’m drenched in sweat every time! The benefit: you get in a full-body workout, activating muscle groups that don’t do a lot of work when you do running only. Question: How often do you run on a treadmill? How do you keep yourself entertained? Now, the part you’ve been waiting for – time to announce the winner of the Naturally Nutty almond and pepita seed butter giveaway! This has been the most successful giveaway on Vegan Runner Eats to date, with 3040 entries and over 300 tweets alone! And the winner is… Laurel C. from Aptos, CA! Congratulations Laurel, you’ll be receiving an email from me with further instructions. Thank you so much everyone who participated! I’ve got another exciting giveaway starting shortly, so stay tuned! Want ot see more fitness and plant-based nutrition tips? Stay in touch with Vegan Runner Eats by subscribing in the top right corner of this post, or by following the blog on Facebook, Twitter, Google+ and Instagram! Tagged running, running tips. Bookmark the permalink. Problem with the treadmill – I’ve brokena knuckle twice on treadmills at the gym. I’ve tried to keep my running form on the treadmill and the sweep of my hand twice hit the side rails breaking a knuckle. I use a stepping machine now but that does not allow for good form either – I just don’t break knuckles on it! Now, I just lift weights at the gym and leave the aerobics to the trail. Good luck with the plantars! Sorry to hear about your misfortune, Chuck! Good to hear that you enjoy trail running though – I hope to get into it eventually now that I live in the Northwest. 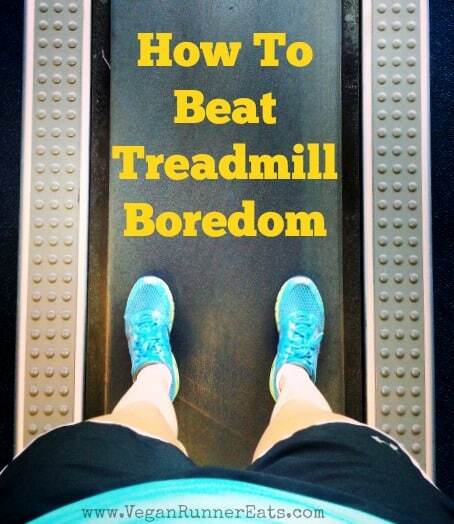 Great advice for treadmill boredom!